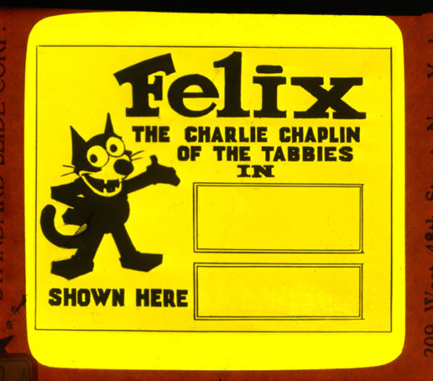 Presenting a thirty-second tour through the career of the hardest-working cat in show business. 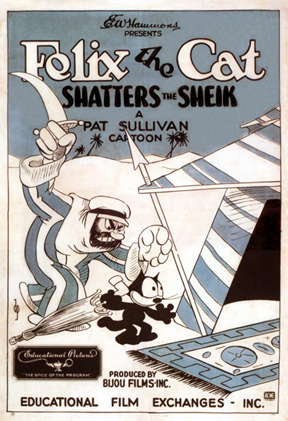 The star of his own series (1919-1930). 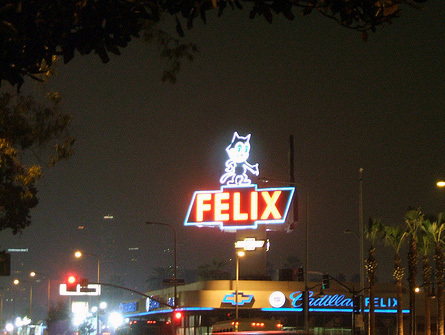 Stepping out in the Hollywood nightlife. 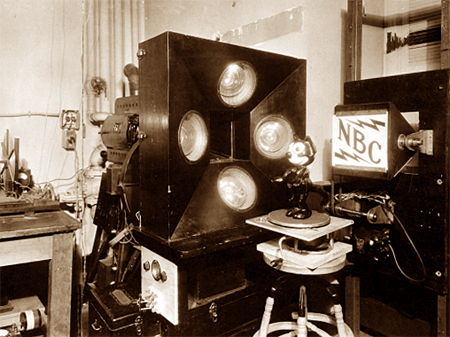 The first silent star to appear on television, Felix was the subject of an experimental 1928 broadcast at what is now New York’s WNBC. Today: still maintaining a business empire. 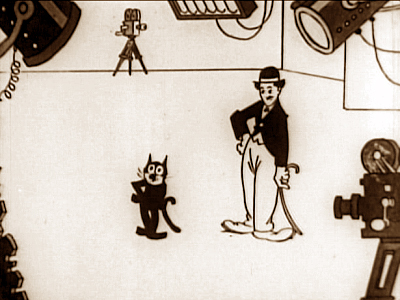 Well, it’s a bit of a lazy Sunday here at The Silent Movie Blog. Rather than write up the post I was going to present (it was another of the depressing ones, so you ain’t missin’ much), here’s a selection of animated gifs I caught dancing through the internet. Enjoy. 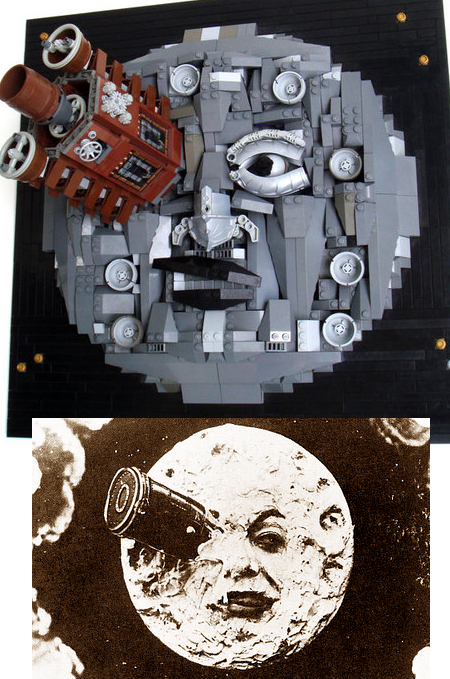 At the 2009 “BrickCon” Lego convention, the winning entry in the “Best Art” category was Guy Himber’s homage to George Melies’ A Trip to the Moon (1902), created entirely from Lego blocks. Here’s a sixty-second whirlwind tour through the summit of civilization, the climax of culture, the period of perfection… my favorite era. 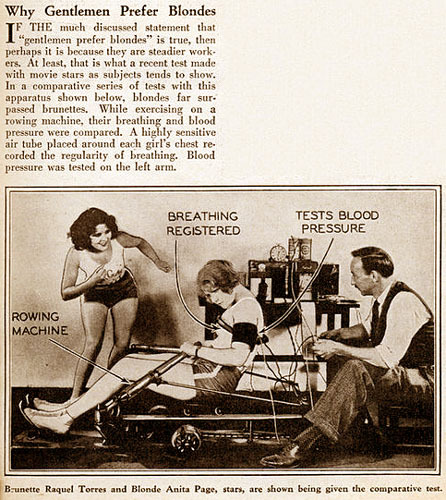 Shortly after she came up short in this experiment, Raquel Torres was dropped by M-G-M. Coincidence? 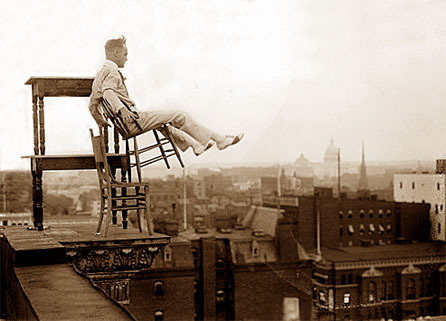 Daredevil John “Jammie” Reynolds, overlooking Washington DC. Little is known about this guy and I don’t know whatever became of him, but I’m guessing he didn’t die of old age. 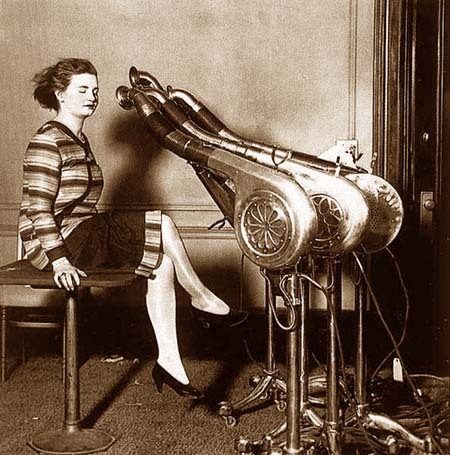 The cutting edge of hair dryer technology. 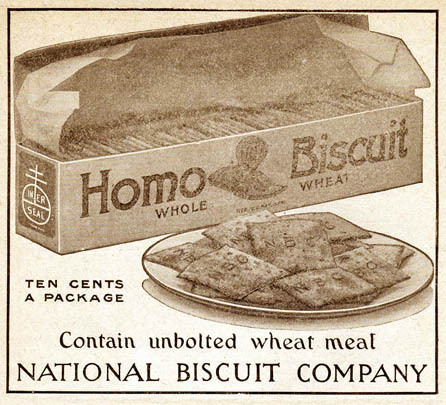 Set them on fire and they’re flaming Homo Biscuits. 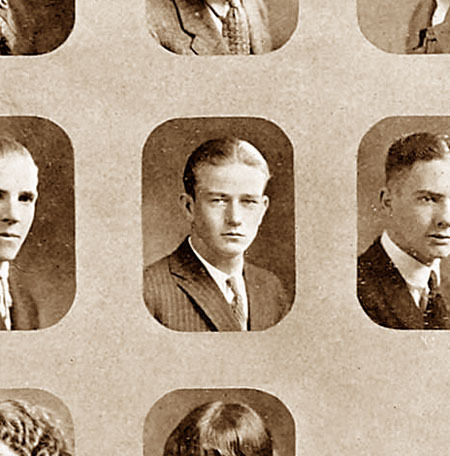 In 1924, they weren’t calling him John Wayne yet. And then The Jazz Singer came along and ruined everything. 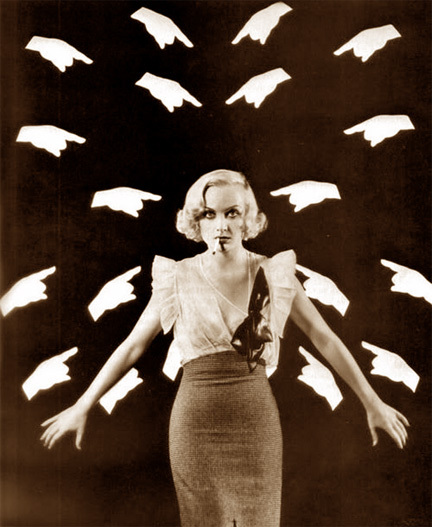 If you’ve watched very many silents, you’ve seen someone standing in a pose of utter condemnation: the scowl, the glare, and that outstretched arm pointing the index finger of fury. You saw it when Burr McIntosh sent Lillian Gish out into the snow in Way Down East. Here are some more examples. 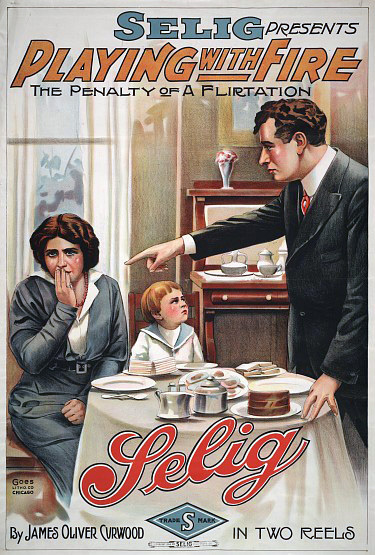 The penalty of a flirtation only begins with the stark finger. 1914. 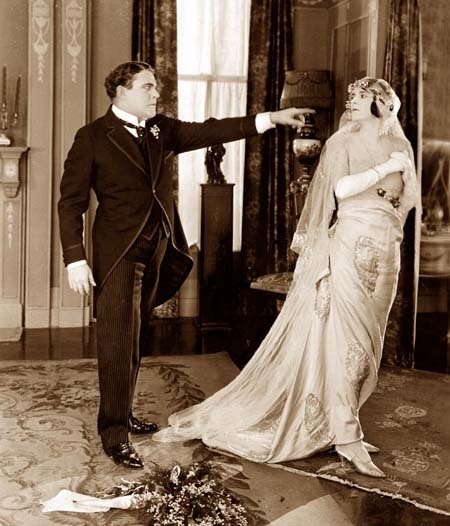 Myrna Bonillas gets the finger from William Farnum in Shackles of Gold (1922). 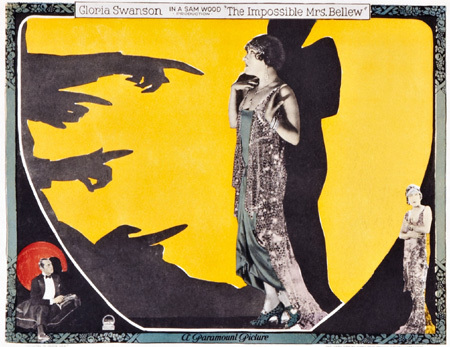 Gloria Swanson faces multiple fingers in The Impossible Mrs. Bellew (1922). Gloria must have been really bad. 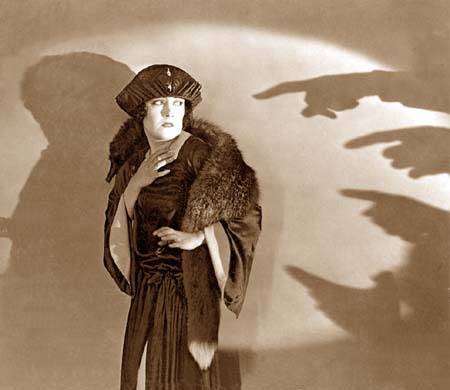 It’s finger time for Jetta Goudal in Lady of the Pavements (1929). William Boyd does the honors. 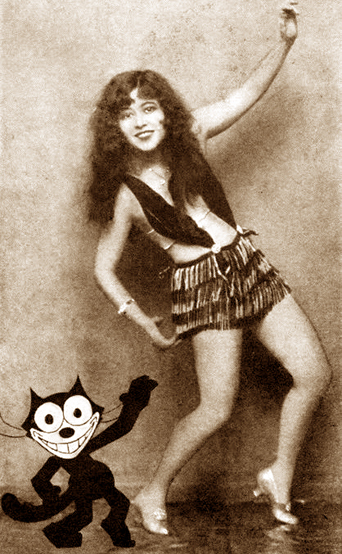 Meet the cutest silent film comedienne you’ve never heard of : Truus van Aalten. A Dutch girl working in the German film industry, she did well in both silents and talkies, until the Nazis came to power. She spent the rest of the 1930s back home in the Netherlands, where film work was scarce. During the Nazi occupation of her country, she was offered roles again, but she refused to become a wheel in the Nazi propaganda machine. 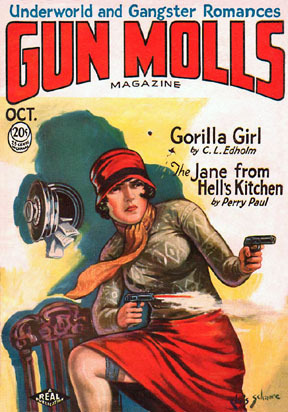 After the war, she tried to return to the screen, but it was too late; she never appeared in another film. She passed away in 1999. Even after becoming a national sensation, Valentino only got second billing in Beyond the Rocks (1922)… and no billing at all on this lobby card. … though the doorman might have preferred a western. The Valentino legend is all about romance, but his best films had everything. 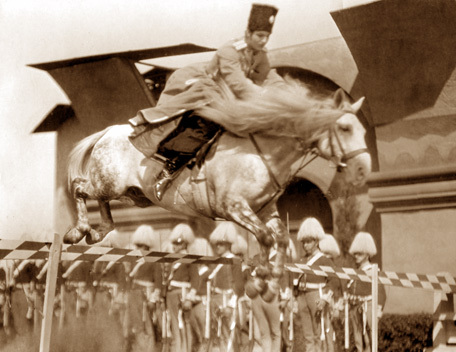 Here, he rehearses an action scene for The Eagle (1925). His image was often kidded, scolded or scorned during his lifetime; less so afterward. If she’s not a fan yet, she will be soon enough. Valentino meets little Gloria Corea during a visit to San Francisco in June 1926. Two months later, the life is all over. But the legend is only beginning. 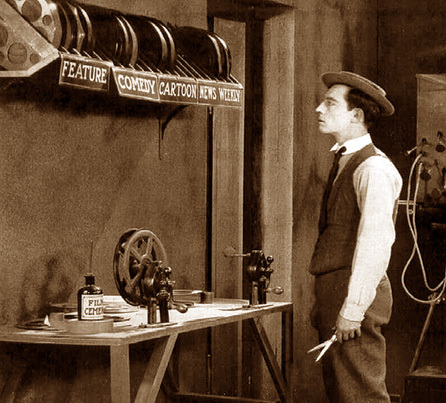 One thing that’s always interested me about the silent era is the durability of fame. Some of its greatest stars are now little more than names in film reference books: Norma Talmadge, Milton Sills, Thomas Meighan. But there were other silent stars whose mystique endures in the 21st Century. The faces of Chaplin, Keaton and Louise Brooks are still recognized by millions today, and each of those stars have devotees just as dedicated as anyone back in the 1920s had been, if not more so. That’s especially true of Rudolph Valentino. 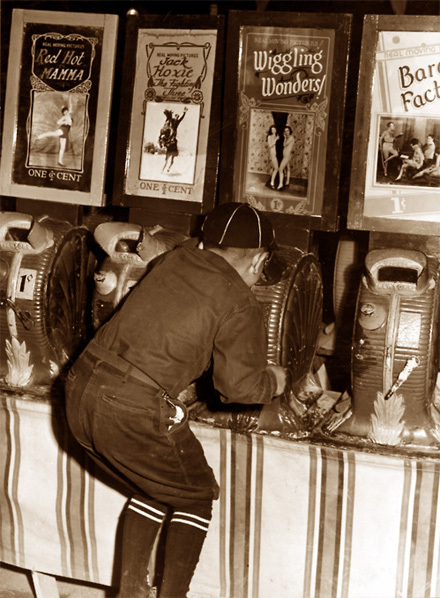 He was a celebrity in the mid-1920s, and sometimes a controversial one, but a sudden serious illness in the summer of 1926 revealed just how deep his fame really was. Newspaper bulletins about the state of his health were announced daily in giant type, margin to margin, and the public was likely as surprised to recognize its own obsession with the man as it was by his precarious mortality. His death drew spontaneous mobs to the hospital, the church and the mortuary: genuinely despondent admirers, milling about helplessly. Movie stars had died unexpectedly before. But this was different. Valentino was so larger than life that he was larger than death, too. 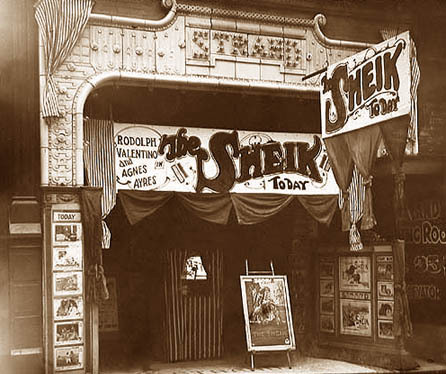 Screen Secrets reported in September 1928 that at the New York headquarters of United Artists, the company was still receiving an average of five letters a day asking for more Valentino movies, even though everyone knew the man was gone. Like that of Marilyn Monroe, his final resting place is something of a tourist attraction. But no one comes by for the glamor. It’s a somber destination. The overwhelming majority of visitors to his Hollywood crypt bring silence and respect with them, leaving their cynicism in the car to bake in the California sun. And it’s always been that way; even in 1929, according to Motion Picture Classic, the crypt was drawing between 25 and 150 visitors a day, with up to 500 on holidays. That pace has understandably dropped off since then. But still they come. And the faithful aren’t simply moping in perpetual grief. They love him. There are Valentino collectors, biographers, websites, online communities. 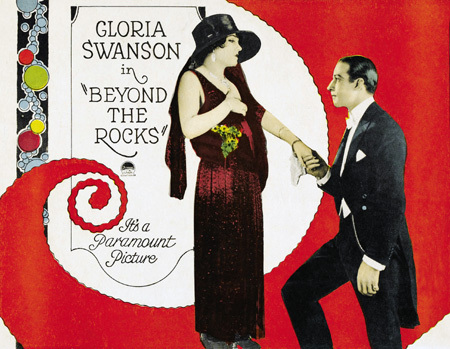 After the long-lost Beyond the Rocks turned up in Europe recently, a new print was struck and toured major theaters, drawing delighted fans in droves. There’s really something unique about Valentino. 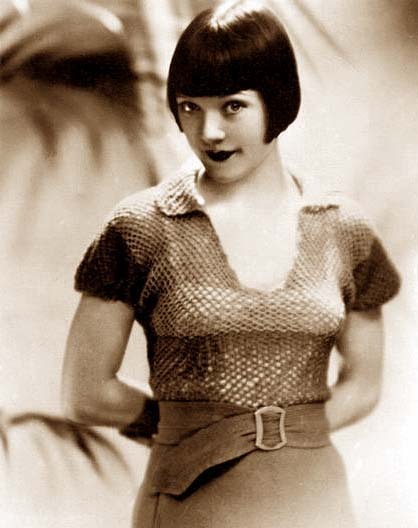 The charisma and talent are there, and a distinctive courtliness (born in old Europe) that was rare enough in the silent era, and extinct today. But Valentino carries something deeper, too. 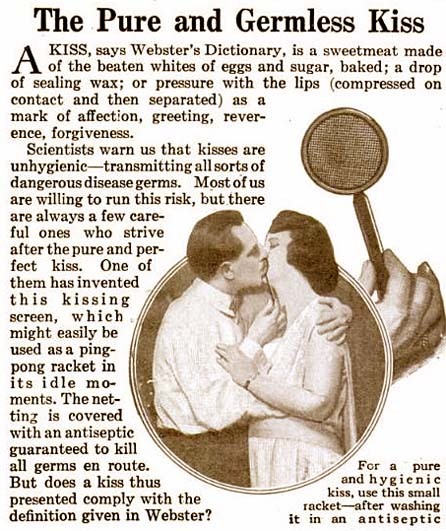 The shorthand for it is “romance,” but it’s more than that. Plenty of matinee idols went through the paces of huggin’ and kissin’, but with Valentino that always seems to come with rich incense and mandolins strumming in the background. When he looks into the camera, he looks at you, deeply and with candlelight reflected in his eyes. It’s Romance 2.0. The truly dedicated Valentino buffs are a breed apart. No other screen star ever had devotees animated by such a driving passion. 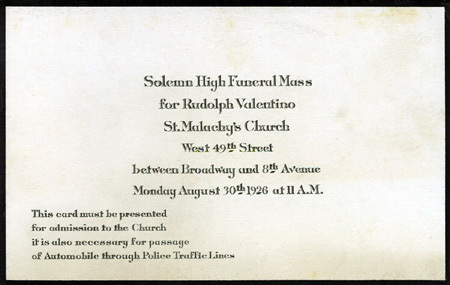 Homosexual Valentino fans argue persuasively that of course Rudy was gay: you can just tell! Heterosexual Valentino fans argue that of course he was straight. Both sides can cite a convincing set of facts and informed speculation. Would Valentino have made it in talkies? The consensus opinion is in the affirmative. Personally, I’m not so sure, but who knows. Recent months have seen an unseemly schism among the faithful. Battle lines have been drawn, charges hurled, feelings wounded. Lawsuits are threatened. It’s all very real and painful to those caught up in it, and regrettable (especially since I’m acquainted with some of the folks involved, and they’ve all been nothing but nice to me). I’m hoping for reconciliation. Here are some of the key online landmarks for anyone intrigued by Valentino. 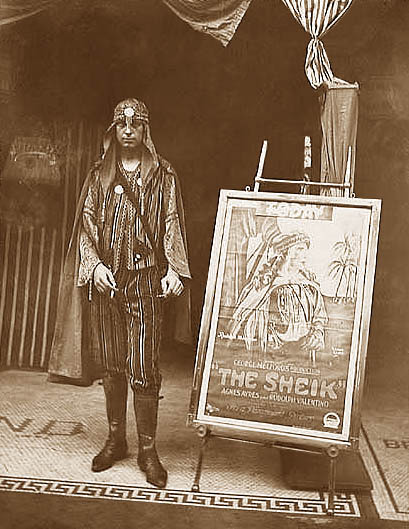 To see the man in action, I recommend this deluxe (but affordable) DVD of both The Sheik (1921) and the sequel that tops it, The Son of the Sheik (1926). For questions and answers about his life and career, there’s a Yahoo group that’s been humming for over a decade now. 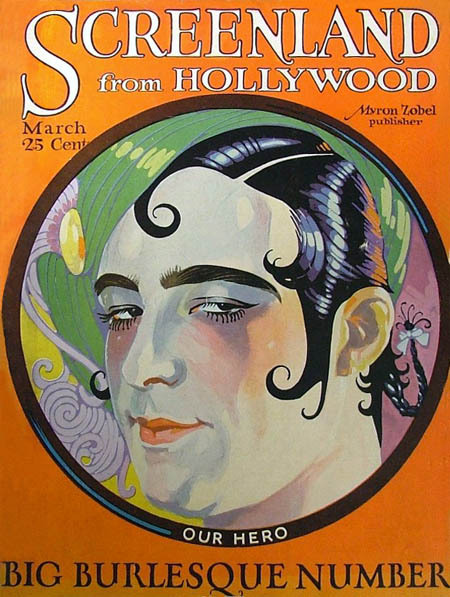 There’s also Hala Pickford’s Rudolph Valentino Society, with its own forum. There have been a lot of books on Valentino over the years, but be careful. Some of them are awful, and the earlier ones aren’t very reliable. The most acclaimed biography of all is probably Dark Lover by Emily Leider. This week marks the release of the most eagerly-awaited addition to the Valentino bookshelf since the Leider bio, the sumptuous Rudolph Valentino: The Silent Idol by Donna Hill. It’s so new that I haven’t seen it yet, but the pages reproduced at her website are tantalizing, and the early reviews are unanimously glowing. The author will have copies for sale at the San Francisco Silent Film Festival, and (I believe) at Cinecon over Labor Day weekend.